As part of this project, Margie Clarke produced both a Procedures Manual and suggestions on a library policy for the ESBC to be implemented by our library committee. Sylvie Dufresne has produced a database listing of our serials. A PDF file is available here. 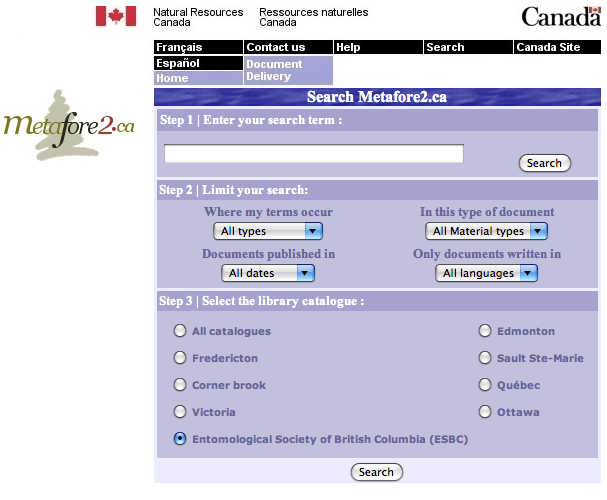 Our serials are now listed online in the Natural Resources Canada Library database Metafore2. The search module for Metafore2 is illustrated below. You will see that the last item listed in Step 3 is our catalogue. press SEARCH and all will be revealed. You will note that the first catalogue that you can choose in Step 3 is “All Catalogues”. This means that users have access to all Natural Resources Canada Forestry Centres’ materials through Metafore2. This could be very useful to many students and faculty, especially in the forest entomology area. If you do choose “All Catalogues” you will need to limit some of the parameters in Step 2. Librarians can see further information about these holdings via AMICUS.